If you’re like many singers out there, you may be presently struggling with how to sing high notes. You may have spent hours, days, months, or even years trying to reach those notes that are just outside of your range. Bad part is, most people, even the ones that practice regularly, are at best getting slow and small results doing this. Well, I have good news for you. The truth is, singing high notes is not nearly as difficult as you may imagine. The reason it’s difficult for most people to grow their range is simply because they’re going about singing the wrong way. Reaching for higher and higher notes may over time increase your range by a note or two, but odds are that new found range will be clunky and inconsistent. So, let’s talk about a new and improved approach to expanding your range. I’ll call it Ken’s How to Sing High Notes 2.0. That’s right, singing should be as easy as speaking. Reaching for notes is a big no, no! 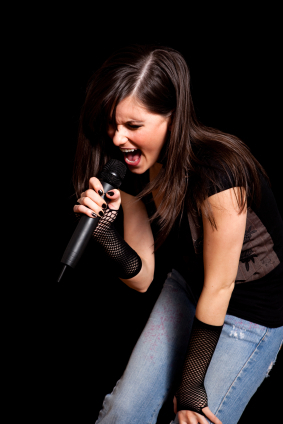 If you’re putting extra strain on your voice to hit a note, then you’re trying waaay too hard! So, how do we make singing as easy as speaking? Well, the ideal speaking voice is smooth and connected, has a steady flow of air, and is full and free. You don’t have to press your speaking voice, so you shouldn’t have to press your singing voice either. Finally, a typical speaking voice comes from a balanced vocal mechanism. So let’s break this all down a bit. 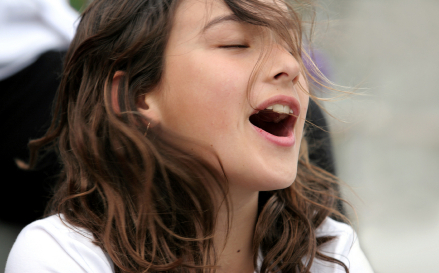 Steady Flow of Air: Having a voice that is powered by a steady flow of air is crucial for singing higher. You see, the air is the gas that powers our voice, and you’ve got to have the right amount of air flow exiting your body while singing. If you force too much air when you sing, you’re going to create too much resistance underneath the vocal cords, leading to unnecessary pressure building up in the throat. This causes discomfort in singing, your larynx to rise, and eventually will force your voice to crack. Use too little air and your sound will become weak and putter out. The flow of air is controlled by the diaphragm. Want to learn more? Read Breathing and Singing. Smooth and Connected Sound: A smooth and connected sound is another important aspect of keeping a “speak singing” balance. This goes hand and hand with operating off of a steady flow of air. Actually, I’d argue keeping a smooth and connected sound is usually the product of a steady flow of air, with one exception – when we’re singing staccato (separated or unconnected notes). But even our staccato notes need to function off of that same steady flow of air. The air does not stop. Think of the flow of air as a hose. If you have a put a kink in the hose, the water doesn’t stop… it’s still there waiting to come out. Likewise, the water doesn’t build up in strength, forcing the kink out of the hose. The flow of water remains steady behind that kink, ready to come out when needed, but not forcing it’s way through it. Your voice should function the same way. When singing staccato, you’ll want to keep the air pressure moving forward, ready to sing the next words. Don’t stop the air pressure, but don’t let it build up in the throat either. I suggest feeling that pressure in the front of the mouth (usually behind the lips). Do this, and you’ll continue that steady flow of air, as well as maintain a smooth and connected sound, even when you’re singing staccato. It’s a beautiful sound. Don’t Press Your Voice: Another important aspect of “singing like you’d speak” is you shouldn’t have to press your voice. Too many singers push their voice on notes that are more difficult. I think this usually comes from misinformed people telling people to push the notes out. Whatever the reason, pressing to get the sound out is a 100% sure recipe for unbalanced, range limiting singing, and should be avoided at all costs. Singing with a Balanced Vocal Mechanism: Finally, the reason why we want to sing like we speak is because we’ll have a balanced vocal mechanism. To me, this means a couple of things: we’ll have a cord closure, and we’ll have a level to lowered larynx. Let’s start off talking about cord closure. Cord closure is the act of the vocal cords coming together to create the sound. When the cords aren’t fully zipped up, more air is able to eek out. This is bad for a couple of reasons. One, it creates an undesired breathy sound, and two, cord closure is what helps regulate that steady flow of air we were talking about earlier. Lacking good cord closure causes trouble because it’ll forces us to use unnecessary muscles to create the sound, causing unneeded tension that gets in the way of a free voice. Next, we’ll chat about the larynx. The larynx is also known as the voice box and is where the vocal folds are located. When the larynx is level, as it often is when speaking, our voice is in optimal position for singing. However, it is very common for the larynx to hike as we sing, especially if our tongue is tense, or when we’re singing higher. For this reason, keeping a lowered to level larynx is imperative for free singing. As the larynx rises, be it because of tongue tension, too much air pressure from below, or inefficient airflow, it throws the whole vocal mechanism out of place and moves the singer closer and closer to cracking their voice. Releasing the “swallowing muscles” is a good step toward reversing a rising larynx. If you need a bit more though, you can start singing in a hooty tone, which will also help release the larynx down. Finally, spreading your vowels (ie smiling while singing high) also can cause the larynx to rise, so instead think of making the vowels taller and more narrow. Summing It All Up. . .
Singing high notes isn’t about reaching higher and higher, forcing your voice to find a way to push the notes out. Doing this will not only put unnecessary fatigue on your voice, but will also cost you more time in the long run when you have to reverse old habits. When working on how to sing high notes, focus on singing like you’d speak. Instead of pressing, maintain a steady flow of air while keeping the tone smooth and connected. Then, make sure that you have cord closure (non-breathy sound) and a level to lowered larynx. Once you learn to balance all these different aspects of singing, you’ll slowly begin to discover your voice effortlessly soaring higher and higher. Do this right and you won’t see your range increase by a mere note or two, but potentially by an octave or more! I hope this helps. If you enjoyed this article, you should Join Our Facebook Community Page and receive weekly tips on how to improve your voice.